O death . . . no sting! O grave . . . no victory! O silence . . . new song! O dread . . . new dance! O tribulation . . . now overcome! that holds no more darkness. You are invited to a special worship service early in the morning tomorrow, Sunday, April 21 where we’ll specifically celebrate Jesus, the One, our risen Savior! At 6am at Mt. Hope Cemetery, please gather to hear Carl Cosaert and Cassandre Beccai share homilies about what Jesus’ resurrection means to them, and WWU students Cedric Manahan and Emma Ramirez who are leading worship music. At the end, you are welcome to stay for a light breakfast provided by Pastor Troy Fitzgerald and his team. Please contact Pastor Kris with any questions. Many thanks to Emily Ellis, 2020 ASWWU Spiritual VP and Corey Bom, WWUC student pastor, for their leadership in creating this program. We thank two chamber ensembles for sharing their music with us. The Walla Walla University String Quartet consists of Willa King and Emma Knight, violin; Roylan Messinger, viola; and Brandon Rittenour, cello. This quartet is directed by Cristian Neacsu. The Westwind Quintet, directed by Ron Coleman, consists of Talea Shupe, flute, Sydney Peck, oboe, Ron Coleman, clarinet, Roylan Messinger, horn, and Nicole Griggs, bassoon. Please join me in wishing these students a warm Walla Walla welcome. The String quartet opens our service with the first movement of String Quartet in A Major, Op.18 No.5 by Ludwig van Beethoven (1770-1827). They also play an arrangement of the “Higher Ground” (hymn No.625) by David Ledgerwood, chair of the music department at Maranatha Baptist University in Wisconsin. The wind quintet performs one of the most beloved pieces by Wolfgang Amadeus Mozart (1756-1791), a work especially appropriate on this Easter weekend Sabbath. A translation of the text is given here. The quintet also presents an arrangement of the beloved hymn “Fairest Lord Jesus” (No.240). In the postlude, we hear the last movement of Quintet in E-flat Major, Op.88 No.2 by Anton Reicha (1770–1836). The music of Beethoven and Reicha bookend our service. Born in the same year, these two composers knew each other well. In 1785 the Reicha family moved to Bonn, birthplace of Beethoven, where young Anton became violinist and flautist in the Hofkapelle (court orchestra) of Max Franz, Elector of Cologne. Beethoven joined the same orchestra in 1789 playing viola and organ, and their lifelong friendship was cemented. As you prepare your heart to worship I invite you to silently meditate on the words of our anthems or hymns, and perhaps also to ponder your own friendships. Please help the pastors and board better understand the needs of our congregation and plan for the future by participating in a brief survey. Visit this link to take part: www.surveymonkey.com/r/JPF5WM5 The survey is anonymous; your name cannot be connected to your answers. If you cannot access the web-version, paper copies are available at the information desk. Thank you! Todos nuestros servicios se traducen en vivo español por hablantes nativos de español y transmitido a los dispositivos de mano disponibles para pedir prestado a la oficina de información en el vestíbulo. Por favor, ver un diácono en el mostrador de la mañana del sábado para recibir un dispositivo e instrucciones sobre cómo usarlo. All of our services are translated into Spanish live by native Spanish speakers and broadcast to handheld devices available to borrow from the Information Desk in the lobby. Please see a deacon at the desk on Sabbath morning to receive a device and instructions on how to use it. A special dinner is prepared for anyone who is by themselves today. The menu is baked potatoes, Special K loaf, salad, and dessert. You are invited to join a warm group in the Junior High Sabbath School room following Second Service for good company and good food. The 50+ potluck and program will be held on Sunday, April 21, 2019 at 5pm in the Village Church Youth Center, 8th and Bade in College Place. Come and enjoy good food, fellowship and an uplifting variety musical program presented by the Eslinger Family. And of course, please bring a friend! Join Professor Carl Cosaert for the "Steps of Paul and John Tour", an amazing tour through Ephesus, Athens, Corinth, Laodicea, Meteora, and more. The trip begins Wednesday, March 18th to Instanbul and ends in beautiful Athens, Greece. The price of the tour is $2,345 per person plus airfare. For more information, please contact Shelle Blake at shelleblake@yahoo.com. The new sermon series on God’s emotions continues today with Pastor Andreas’ sermon on the subject of “Joy.” Please visit wwuchurch.com/emotions for this week’s recommended resources, and continue to check back every week for future updates! Frances Kinzer, a longtime member of the University Church and a staff member at the University Store died peacefully at her home, surrounded by her family, on April 6 at the age of 93. She is survived by her four children, Kathryn Kinzer Grosse, Lou Kinzer Blanchfield, Steven Kinzer, and Joanie Kinzer. Her memorial service will be held in Heubach chapel on May 4 at 3pm. SonBridge Seeks a Design and Communications Specialist. Design, photograph, write, and edit to communicate with our community and volunteers. Work with an enthusiastic team in connecting lives and empowering change. Call or text 509-529-5848 or send your resume and cover letter to search@sonbridge.org. Calling all knitters and crocheters! Our church gives all new babies a welcome basket that includes a handmade baby blanket. We are out of blankets! If you’d be willing to make blankets as a welcome to our world basket, please be in touch with Pastor Jenn: jenn.ogden@wallawalla.edu. Yarn can be supplied! 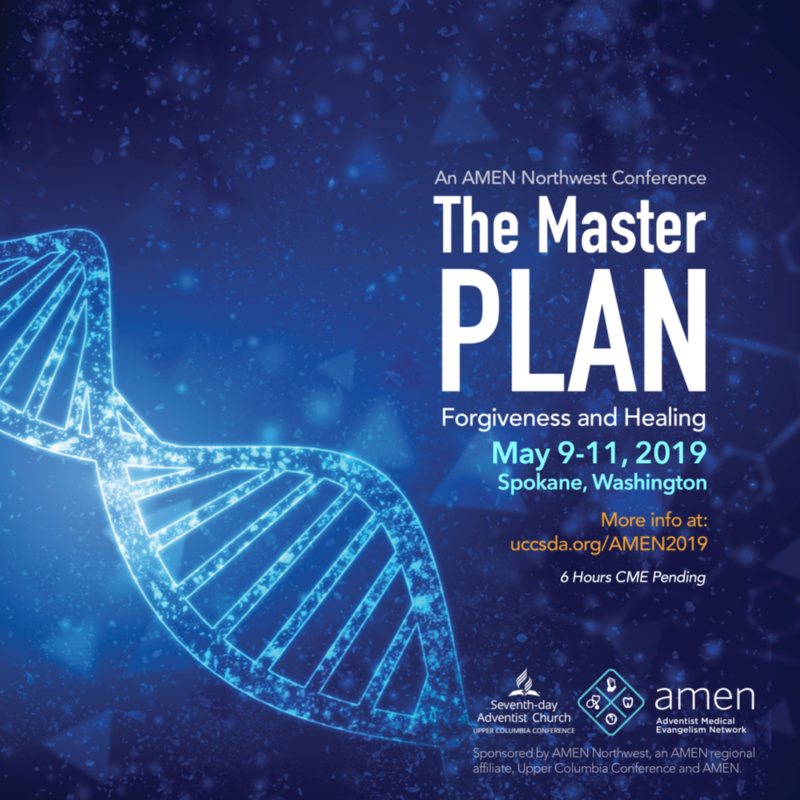 You are invited to attend the AMEN Northwest Conference The Master Plan: Forgiveness & Healing on May 9 – 11, 2019. It will be held at the Upper Columbia Conference office in Spokane, Washington. This conference is a wonderful continuing education opportunity for you as well as for health care providers, health ministry leaders, and gospel workers. The keynote speaker is Dr. Mark Sandoval. Dr. Sandoval is the medical director of Uchee Pines. He will be speaking directly to the theme of the program which is taken from Psalm 103:1-5. Dr. Hana Kahleova is speaking on the role of a plant-based diet on diabetes. Dr. Kahleova is the director of clinical research for the Physician’s Committee for Responsible Medicine. And, finally, Dr. James Trott will talk about the role of the Holy Spirit in caring for people. Dr. Trott is a professor in the Loma Linda School of Dentistry. You can find more information and register at uccsda.org/AMEN2019. There is a $30 discount for registration on or before April 30, 2019. Use coupon code AMEN at checkout. The Discovery Preschool at Walla Walla University is offering a morning preschool program for ages 3-5 during June and July. We will work around your vacation time and you can come 1-5 days during the week. Please contact Elizabeth Yaw by May 1 for more information, elizabeth.yaw@wallawalla.edu. ASWWU Global Service is putting on the annual International Food Fair! We are hoping to get as many members of our church family involved as we can. If you are interested in making food for this event or volunteering to help out, you can reach us at aswwu.globalservice@wallawalla.edu. We are looking for donations, or we can help reimburse the cost of ingredients! You are invited to a FORUM conversation about headship theology, an authoritarian system of patriarchy with far-reaching implications beyond just opposing the ordination of women. Carl Cosaert, Mathilde Frey, Dave Thomas, and Henning Guldhammer will lead in Heubach Chapel on Sabbath, April 20, 3:30pm. All are welcome! Walla Walla University alumni and friends are invited to attend Homecoming Weekend 2019, April 25–28. Events are planned around the WWU core theme of excellence in thought and will include a banquet on Thursday evening, the annual Awards Celebration on Friday morning, a variety of fun and interesting seminars on Friday afternoon, PRISM Vespers, class reunions, and more. A full list of weekend events and registration information is available at wallawalla.edu/homecoming or by calling Alumni and Advancement Services at 509. 527.2631.